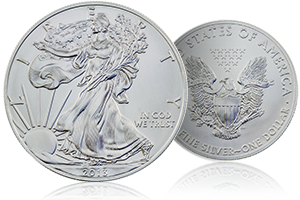 There is no more popular silver bullion coin on Earth than the American Silver Eagle. In 2013 alone, over 40 million of these 1 oz silver coins were produced by the U.S. Mint, shattering all previous sales records. Yet, you may be surprised to find that this series also offers some intriguing collecting opportunities. Certain years of issue within the ASE series have significantly lower mintages than other common dates. This results in lower availability for these coins, which drives up the premium over their metal value that they will command on the open market. Demand for these "key dates" generally remains robust, as there are plenty of collectors that try to complete the series. Such a task almost always begins with acquiring the key dates. If you are beginning to collect the bullion version of the Silver Eagle, the most important dates to look for are 1986 (the inaugural year of issue), 1994, and 1996 (the lowest mintage year). Getting your hands on these dates will require a little extra work, and will be more costly, but they will stand out as the highlights in any ASE collection. The American Numismatic Association (ANA) has recently published an article on their website addressing key date Silver Eagles. Further insights into the key dates, and why they're coveted, are provided therein. The popular Proof Silver Eagles are also covered in the article. This information will assist you in choosing which dates to target, and how large a premium you can expect to pay for them. As we always like to say, it's all about getting "The Right Coin At the Right Price." 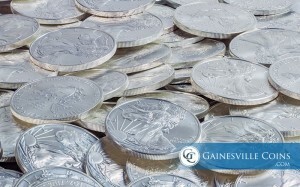 At Gainesville Coins, we have a wide variety of Silver Eagle dates for sale, and we're always making additions to our inventory of Silver Eagles when we come across interesting pieces we think our customers will enjoy. We offer competitive prices on all of our products, and are here to help you with all of your coin collecting and precious metal investing needs.